Adorned with a shiny metallic cuff at the upper, Aquazzura‘s Rendez Vous is a classic shoe with an eye-catching upgrade. No wonder the Duchess of Sussex (aka Meghan Markle) wore them to the 2019 Endeavour Fund Awards held at Drapers’ Hall in London, England. Joined by her husband, Prince Harry, she styled them with a Clare Waight Keller-designed look for Givenchy and a Givenchy clutch. The pair is crafted from suede and specchio leather in a mix of rich black and gleaming gold. It sits on a sky-high stiletto heel to create a leg-lengthening effect. While we haven’t seen pictures to prove it, Rihanna reportedly wore these glamorous heels to the 2018 Grammy’s after party. 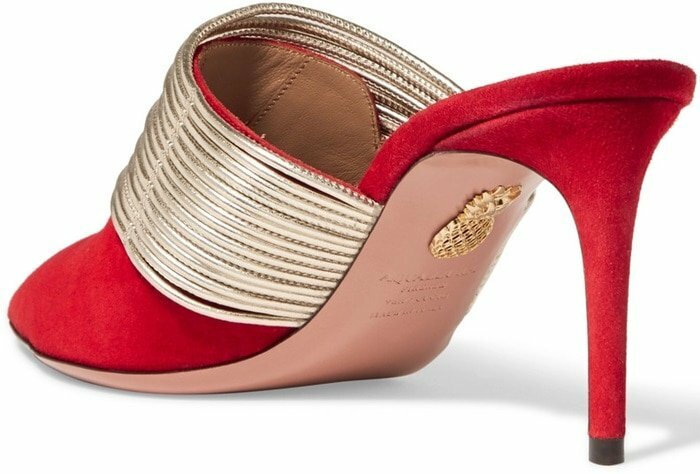 You can buy Aquazzura‘s on-trend heels with chic goldtone multi-strand strap at Matches Fashion, Saks Fifth Avenue and Net-A-Porter. Perhaps you prefer the closed-toe version that you can buy in off-white, powder pink/cipria, black, and red? 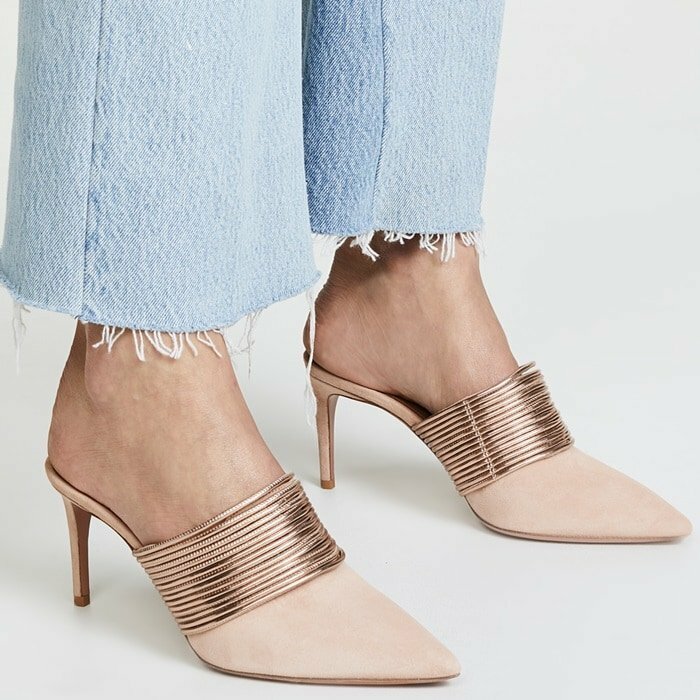 These mules are detailed with the same fine metallic strips as those seen on the label’s coveted ‘Spin Me Around’ sandals. Designed in an elegant point-toe silhouette, this off-white pair has been impeccably made in Italy from smooth leather. These soft red suede point-toe mules are trimmed with fine strips of pale-gold leather. They come in a designer-stamped box that’s printed with the motto, “If the shoe fits, buy them in every color”. This point-toe pair has been crafted in Italy from soft black suede and is set on a 75mm heel. You definitely need a rendezvous with these amazing goatskin mules. 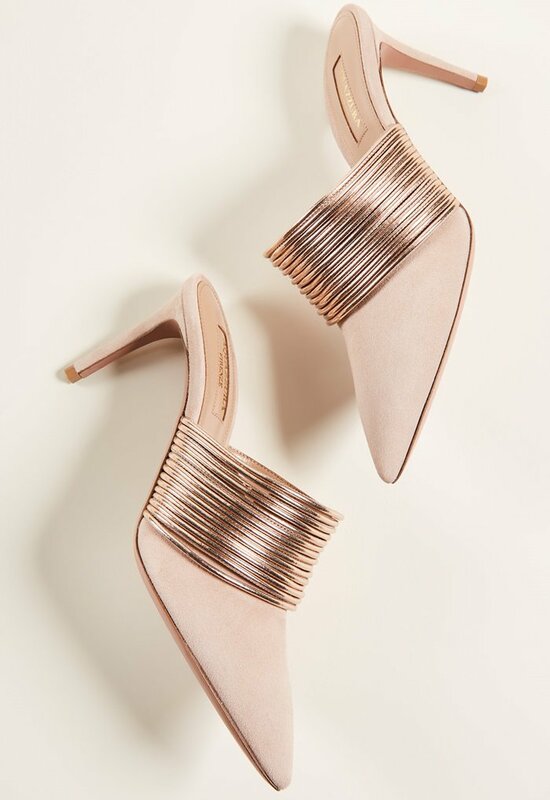 Rose-gold cords amp up the glamour, while the pointed toe keeps things feeling refined, so you can make the most out of your slip-on style.